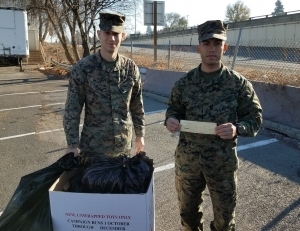 The Toys For Tots event was again very successful with four large bags full of toys and a $1,000 check being given to the Marine representatives. The members of the Inland Empire Fly Fishing Club have always been extremely generous in regards to this program and this year was no exception. Sgt. Faudy Familia and Corporal Nate Medellin came by Frankie Doodles during a recent Liar’s Club luncheon to gather the toys. The donations this year have been coming in at a rapid rate and they apologized that they could not attend our meeting. Just that day they were picking up donations at 100 sites. The program will help those families that are not so fortunate have a better Christmas. A huge thank you goes out to all the IEFFC members for their generosity.